Homemade Copper and Brass Tarnish Remover. Mix baking soda and white vinegar together to create a paste. It'll fizz for a minute, but will quickly settle down. 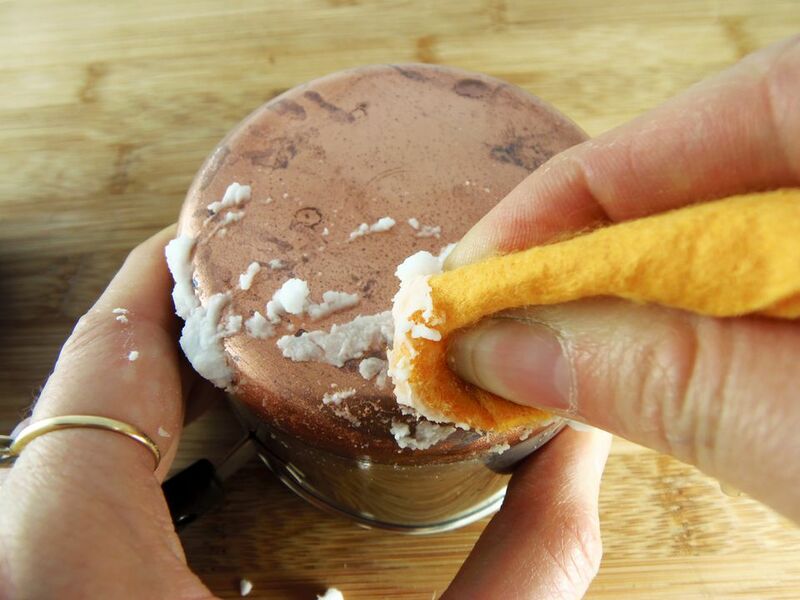 Then, rub the paste into the copper or brass object that you wish to clean, using your hands or an old toothbrush. Let it sit for 30 minutes or so. Then, rinse, and buff with a dry cloth; and enjoy that like-new gleam! The acetic acid in the vinegar and the sodium in the baking soda work together to dissolve the tarnish. And the baking soda provides just the right amount of grit to scrub all that tarnish away, without scratching the surface of the piece that you're cleaning. 1. Be sure to use a soft cloth or brush. Stiff brushes, scouring pads and other scratchy tools could damage copper and brass. 2. If the object you're cleaning is badly tarnished, you may need to repeat the process to get all the tarnish off. 3. No vinegar? Use lemon juice instead. The citric acid in lemon juice works just as well as the acetic acid in the vinegar. 4. This homemade polish can also be used to clean bronze. 5. Do not use this method to polish lacquered copper or brass. Warm, soapy water should be sufficient. In fact, if the lacquer is in good shape, the metal shouldn't be tarnished anyway. 6. Consider wearing gloves while you're cleaning your tarnished pieces, so the oils from your hands don't get onto your cleaned copper or brass. The oils will quickly tarnish the freshly polished metal. If you don't have vinegar and baking soda on hand, you can also use ketchup to remove tarnish. Just grab the ketchup bottle from your fridge. Squirt some on the piece you want to clean, and work it in with your fingers or a sponge. Let it sit for a little while, so it has time to go to work on all that tarnish. Then, rinse it off, and dry your piece thoroughly. Easy and kind of fun, too. Another option: lemon and salt. Simply slice a lemon in half, sprinkle the cut side liberally with salt, and rub it over the surface of the piece you're cleaning. Re-salt the lemon periodically, to maintain your scrubbing power. Then, rinse; dry; and you're done. Is It Solid Copper/Brass or Copper/Brass Plate? If a magnet sticks to it, it's plate. If it doesn't, it's solid copper or brass. Why does this matter? Because plate is just a thin layer over some other type of metal. If you're cleaning a plated piece, you'll need to be extra careful that you don't wear off the plate with all of your polishing. While it may not be an issue this time, it could become an issue over time with repeated cleanings. Don't touch the copper any more than you have to. The oils in your hands will cause it to tarnish. Dry your copper pots and pans as soon as you wash them. If you allow them to air dry, they'll tarnish. Don't put your copper kitchenware in the dishwasher. The harsh detergents will lead to tarnish. Regularly dust any copper pieces that you don't uses often. If you allow dust to sit on the surface, it'll cause tarnish to form. These best practices won't eliminate tarnish entirely, but they will cut down on how often you need to polish your pots and pans.